Please contact Beth (bethbach2@gmail.com) for more information about this pet.Sweet Pea, outgoing & beautiful! Soft, slightly fluffy fur like fleece.Sweet Pea was owner surrendered to the shelter and she didn't even get to keep her name because they didn't care enough to leave it. So her foster mom gave her a new one to show that even though she's had a rough time lately, she has retained a gentle and loving spirit. 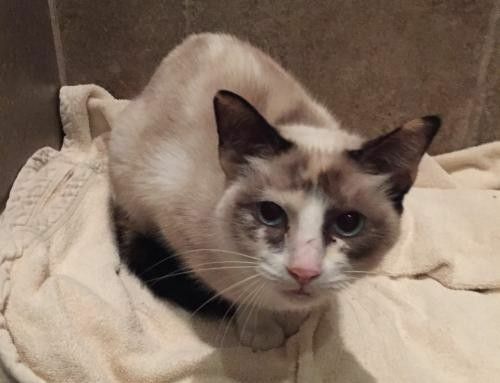 She's an absolutely adorable tortie point Siamese girl, two years old. Very gentle and friendly. Sweet Pea has a chronic congestion sound to her breathing that is caused by a congenital narrowing of the nasal passage where her nose meets her throat. We took her to a specialist to make sure she didn't have something serious going on. The good news was that her condition isn't progressive and causes her no problems. The bad news was that nothing could be done to correct this issue without endangering her life and that certainly isn't worth it since the condition doesn't affect her health. Any Austin allergy sufferer should recognize the sound Sweet Pea makes at times and commiserate! She is absolutely the friendliest, most easy going cat! So far she has adored everyone who comes to visit her foster home and doesn't mind having even young children love on her. Sweet Pea would love to have a family of her own! Contact foster mom Beth for more info. bethbach2@gmail.comVisit this organization's web site to see any additional information available about this pet.